Before the scientist career trailer is released, I thought it would be fun to look back on the previous inventions our sims could… err… invent. While it would be nice to see some of these make a reappearance, new inventions are always welcome, as I’m sure we’ll see soon. Sims 2 Open for Business included the robotics talent badge. With it, your sim was able to invent four types of roverbots to help with everyday life. As long as they were built correctly, that is. HydroBot: Not only could he put out fires, but he could water your garden as well. CleanBot: Dirty plates, ash piles, puddles, nothing on the floor was too dirty for this bot to clean. MunchieBot: Would detect a sim’s low hunger, quickly leave the lot, and bring home something to nourish any grumbly tummies. SentryBot: The mechanized guard dog of robots that zapped and chased off any unruly visitors. While these roverbots were all greatly appreciated, they did come with some negatives. They would only travel on the floor they were located, no using stairs or elevators. So if you had multiple floors in your house, you’d need a bot for each. There was also the potential for the bots to break and wreak havoc on your household until fixed. The CleanBot would spew garbage piles, the HydroBot would shoot water puddles, the MunchieBot would bring back spoiled food, and the SentryBot will shock sims randomly leading to angry visitors and lots of tears. Even so, all these roverbots earned their keep and were worth the time taken to invent. 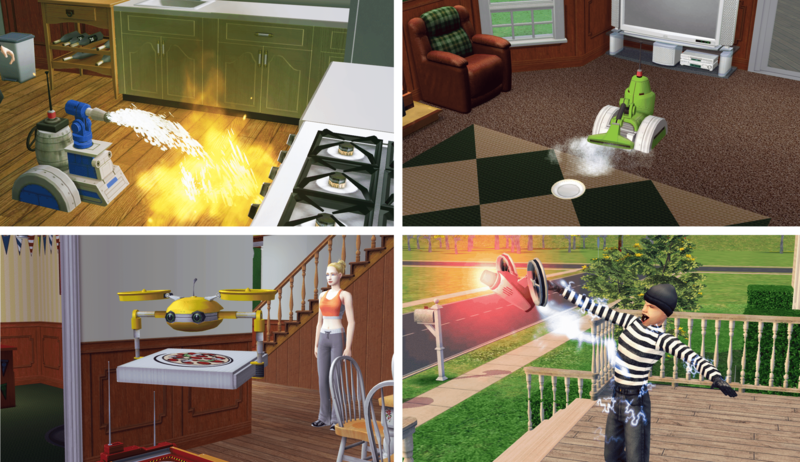 Sims 3 Ambitions debuted the inventing skill, which allowed your sim to create widgets, toys, and more importantly, big inventions. These inventions were nothing like those found in Sims 2, no roverbots here. Floor Hygienator: When walked over, it would release a puff of scented mist that not only increased a sim’s hygiene, but would frequently give a positive moodlet as well. Harvester: No longer would gardening take all day, as this allowed you to harvest everything on the lot in one fell swoop. It could also be used on collectibles such as rocks, gems, insects, and more. Miner: This could be used to create a tunnel system that a sim could use to travel from one lot to another. Sims frequently dug up collectibles while using the miner, and sometimes created explorable tunnels with text-based adventues. 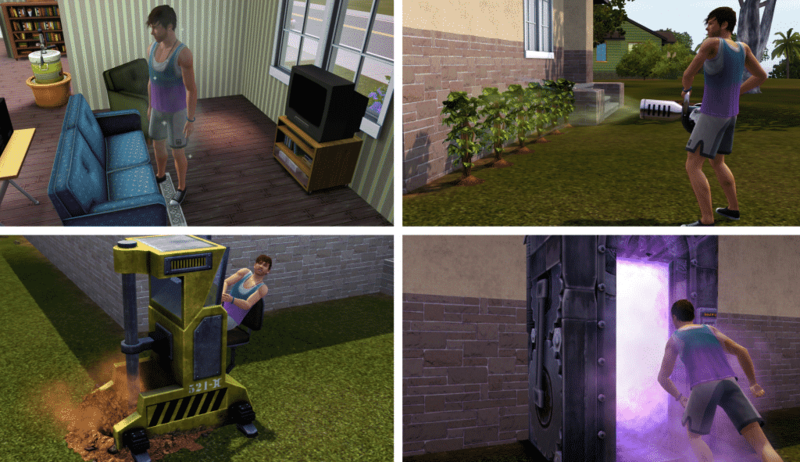 Time Machine: Sims could travel to the past or future leading to any number of results from new family members being added to the household to someone’s career changing. Like the mining tunnels, this was also a text-based adventure. One invention that could be created in both Sims 2 and 3 was a full-fledge robot that became a member of the household. In Sims 2 these were called servos, and in Sims 3 they were called SimBots. These were the life state of each respective expansion and were treated like a normal member of the household, with some robotic flair. As Get to Work already has aliens as the life state for the pack, it’s hard to say whether or not a robot of this nature will make a return with the science career. The above teaser image released for the science career shows a woman sporting a robotic type helmet of sorts. We’ve seen this type of helmet before in Sims 2 with the Thinking Cap and Noodlesoother. They were aspirtation rewards that increased skill gain and needs respectively. Could something of this nature return in Get to Work? 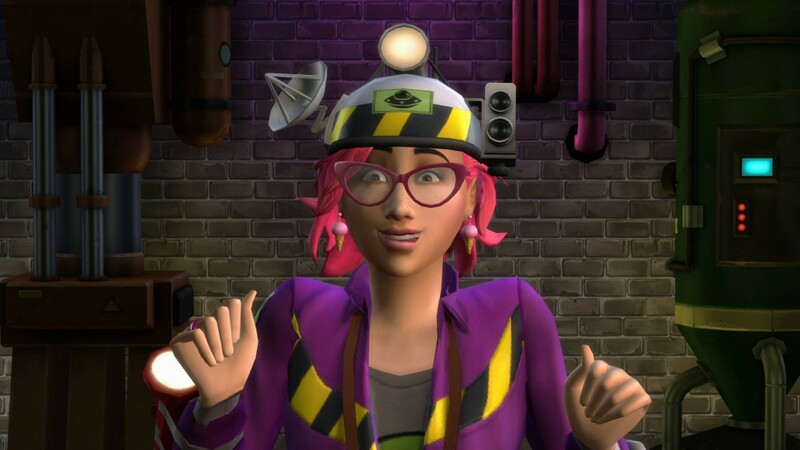 I don’t know about you, but I’m excited to find out more about the science career and what inventions our sims will be slaving away to create. SimCity BuildIt: Tokyo Town Update Now Available!